Sir Hughes is a Breton who can be found at Alcaire Castle. He is the leader of the Knights of the Flame and protector of the Duke and Duchess of the castle. Haunted by dreams of betrayal, Sir Hughes fears that the Redguard army that arrived at the castle is planning an attack. He is determined to protect Stormhaven at all costs even if means being suspicious of his own allies. "You're welcome to Alcaire Castle. I'm sure you noticed King Fahara'jad's army camped outside our walls. So you can understand why Duke Nathaniel is not entertaining guest. I should hope you're not here to add to our troubles." "Ha ha! Don't hear that too often, but it's most welcome. If blood gets spilled here, it could destroy the fragile alliance holding together the Daggerfall Covenant. We need to defuse the situation as quickly as possible." Letting the Redguard envoy in would be a good start. "Damn it! Dame Falhut is holding the envoy up at the gate, isn't she? Never questioning orders is Falhut's strength and her weakness. I'll have to send word to make an exception. Meantime, I actually have a task you'd be well-suited for. Great. What can I do? "It's a...sensitive matter. We've intercepted secret messages to King Fahara'jad from someone inside the castle who goes by the alias of "Almandine." My hope is that a little research in the library might reveal where this term comes from." All right. I can check the library. "Unfortunately, the duke requires that he personally approve all visitors to the library, and he can't know about this. The library guard—Sir Gregory. Perhaps you can persuade him to look the other way, or failing that, to leave his post." "Again, you must keep this quiet. The Duke is already overwhelmed and hearing about a spy inside the castle might push him over the edge. Get past Sir Gregory and into the library, find out who "Almandine" is, and report back to me personally." What does the Duke plan to do about the Redguard army? "For better or worse, the Duke defers to me on the matter for now. Nathaniel shares King Emeric's bloodline but not his talent for calm under pressure. Of course, the Duke's wife being King Fahara'jad's daughter doesn't make matters easier." The Duchess is from Alik'r? "Indeed. Duchess Lakana is one of King Fahara'jad's youngest daughters. They say he was quite fond of her. She doesn't speak of her father much, but I think those ties run deeper than she lets on." Can't you order Sir Gregory to let me into the library? "I cannot defy the Duke's orders—not with an army at the gates. You can. One thing that might help—Sir Gregory is insanely jealous of his wife. In his mind, she would be the sheath to every knight's blade. You didn't hear it from me." "Sometimes, a true knight must undertake a mission that requires reading books rather than slaying monsters. Such is what I asked of you. Did you learn anything in the library?" "Almandine" is Duchess Lakana herself. "I feared as much. We have to proceed carefully now. We don't want to alert the duchess or King Fahara'jad to the fact we know about the secret communications." "I hate to say it, but I'm going to have to speak to with the duke about this. The fact that the duchess is sending secret letters to her father is serious cause for concern. We need to know exactly what they're planning though." "After speaking with King Fahara'jad's envoy, Duchess Lakana asked to go out and negotiate with the Redguard general herself. Clearly, we can't allow that, but the duchess is refusing to let the envoy leave to deliver her message." I could deliver the message. "My thoughts exactly. And in so doing, you would win her confidence. You already helped get the envoy through the gates, so Lakana will be inclined to trust you. Go speak with her upstairs. Do whatever you must to learn her plans. "I trust you've earned the duchess's confidence by now. That's good. Yes. She feared for her life. "After the attempt on her life, that makes sense, but why go to her father? The Knights of the Flame are here to protect her. That makes no sense. Why would he send an army here? The assassin's poison came from Alik'r—the duchess said so herself." Yes, but it was Dame Falhut who purchased the poison. Dame Falhut? Are you...are you certain? That's a grave accusation. Of course, she was opposed to the marriage. We'll have to question her, but sending a Knight of the Flame to apprehend her might not be wise." "I was...hoping you might volunteer. That would help...avoid a scene. "Where's Falhut? Did she run?" No. She attacked. I killed her. "I'm sorry to hear that. You did what had to be done, and I suppose her reaction merely proves her guilt." "I wish I could say there was no longer cause for concern. Somehow, though, I just don't think that's the case. Something about all this just isn't adding up." I agree. It's hard to believe Falhut was acting alone. "Indeed. I would very much like to discuss this with you further—but not inside the castle. My home is past the market. If you'll give me a moment to settle matters here and check on the duchess, I'll meet you there and we can talk." "My house is just past the market. It's the only place I'm sure is safe enough to have this discussion. I'll be there as soon as I've settled matters here." Omen of Fear:"The Duke should have not married King Fahara'jad's daughter." Sir Hughes:"The Duke's marriage was a mistake. He's put us all at risk." Omen of Fear:"King Fahara'jad plans to invade Alcaire. Duchess Lakana is a spy." Sir Hughes:"Lakana has everyone fooled. She and her father are plotting against us!" Omen of Fear:"Duchess Lakana is orchestrating an attack on Alcaire. She must be stopped." Sir Hughes:"The duchess has betrayed us. I have to stop her...whatever it takes..."
Sir Hughes:"I know what you're planning. Your Grace." Duchess Lakana:"What are you doing here? Leave my room at once!" Sir Hughes: "I won't allow Alcaire fall into Redguard hands." 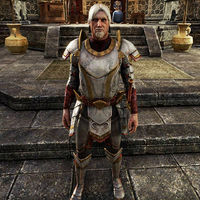 Duchess Lakana:"Alcaire in Redguard hands? Tears of Zeht! You've gone mad!" Sir Hughes: "I'm sorry, but this is the only way." Sir Hughes:"What have I done?" "I killed her. She deserved it, didn't she? I know she did, or I think I know...is this real?" "No. It's an never-ending nightmare, whether I sleep or not. I killed Duchess Lakana. Who or what is the Omen? "The Omen of Fear! Always with me. Always whispering. Telling me about the Redguards, about Lakana. I believed it, but it was lying. I murdered an innocent woman and betrayed the Duke. Now it's hiding, but it's not gone. "We have to kill it. You have to kill it. My sword! In the dream, I left it in the throne room, The Omen is drawn to it. Find the sword and find the Omen." "You killed the Omen. may the Eight bless you. My mind is free..but my sins remain." "Yes, I'm all right...but not absolved. I ordered the Knights of the Flame to rebellion. I murdered the duchess. I betrayed the duke. These stains on my honor cannot be washed away." "I fear that justice would have been better served by my death. I pray your judgment does not prove to be a mistake for the future of the Covenant." This page was last modified on 10 April 2019, at 00:29.